You have found the web site of the Beyond Reality Costumers Guild! BeyondCon 2019 will be held February 8th-11oh at The Inn at Gig Harbor. For more information see the BeyondCon web site. 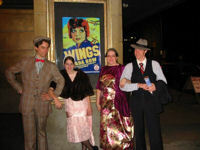 BRCG Members attend a showing of the 1926 movie Wings.